On the 28th Sunday after Petecost, 17 December 2017, His Eminence Metropolitan Vladimir celebrated the Divine Liturgy in the Nativity of the Lord Cathedral in Chisinau. 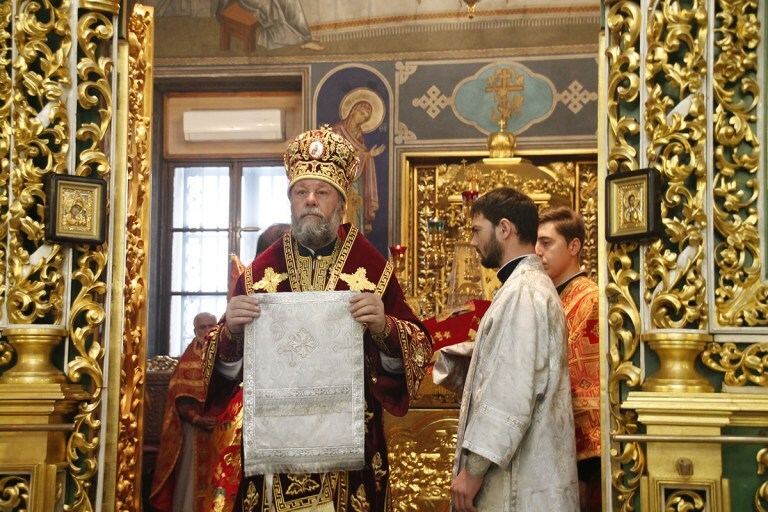 The metropolitan was assisted at the Divine Service by archpriest Vadim Cheibas, Cathedral Dean and Metropolitan Secretary, and the clergy of the Cathedral. Liturgical responses were provided by the Cathedral Choir directed by Angela Angheni. This Evangelical fragment teaches us about the need of being grateful to the Creator for all His mercy cast to the world. Unfortunately, ungratefulness is so specific to the humanity, and is, probably, one of the sources of our sorrow. During the Liturgy, deacon Vladimir Cozonac was ordained priest for the parish of Archangel Michael in Chisinau. The Metropolitan congratulated the newly-ordained priest, and wished him spiritual steadiness and faithfulness to the cause of Christian ministry. Thanks-giving prayers were uttered after the Divine Liturgy, and the church-goers received from the metropolitan icons brought from the arch-pastor’s recent pilgrimage in the Holy Land.